Submitted 12 years 1 week ago by WildCoast.Com. 1856 was a bad year for the Xhosa nation of the Wild Coast. Their lands had been taken by the British, drought had withered their crops, and their prized cattle were dwindling under a mysterious disease. The people were facing a hard winter when hope came in the shape of a young girl called Nongqawuse, the niece of a prophet. Nongqawuse claimed that the spirits of the ancestors had spoken to her from a pool in the Gxara River. If the people would only kill all their cattle and burn their crops, a day would come when new cattle and crops would arise along with an army of the ancestors who would drive the whites into the sea. The "vision" took hold among the desperate people, who followed her orders. By February 1957 more than 200 000 cattle had been slaughtered and left to rot. All the summer crops had been burnt. The allotted day dawned and nothing happened. The weakened population began to starve and within a few months more than a third of the entire Xhosa people had died of starvation and disease. It was easy for the British to take over the remnants of the tattered Xhosa kingdom and imprison the chiefs for their role in this ??genocide??. Nongqawuse was taken to Robben Island for her own safety but her people were broken. The 1856 cattle killing has receded into legend and its tragic manifestation is Nongqawuse's pool, which can still be seen on guided tours from the resort of Qolora Mouth on the Strandloper Coast. See http://en.wikipedia.org/wiki/Nongqawuse for more info. I think it is vey appropriate to do more research on the subject and tell the the tale as it is. Nongqawuse confessed to actually seeing the ancestors, something that is unheard of in our culture (ancestors communicate in dreams, visions and other such paranomal manners).... which further leads to the belief that it was a set-up to disarm the Xhosa and lose all they had. The theory (which I firmly believe), the English settlers pretended to be ancestors and told Nongqawuse to command the people of this great sacrifise. After all, why would she be protected at the end of it all? You are corret in your thinking. The Brits were very brutal. Their avaris knew no bounds. I agree with the previous comment. That was the plan of the colonialists. If you look carefully, the same thing still happens even now. Look at how much the so called mainstream markets (African people) are being researched and look at the products and brands that are being pushed into those markets. The majorities of the Africans; because of the way things are, they have to wake up early to go and 'slave' (work) for white people (that own almost all the wealth of the country 79%) only to come back and spend the same "peanuts" they earned on products and brands that they don't even need - brands and products that are relentlessly being pushed (indirectly enforced) upon them. How does this (Nongqawuse) work these days? Through creating needs that do not exist, certain lifestyles through advertising, giving some experiences through brand activations and promotional specials. For instance, there are more brands marketed to Africans than whites; how do you think Africans end up with more buying power/support that white people that have 79% of wealth in their hands as opposed to 9 that Africans have? In other words the Xhosa were foolish enough to believe a child that was manipulated, even though her story apparently defied Xhosa culture? It sounds like the British were clever, but their cleverness would not have been successful without the ignorance of the Xhosa. Nongqawuse - The Ashamed Silence? Hi thanks for this information. From which book did you get this quote from? “Oh! Nongqawuse, The girl of Mhlakaza Who killed our Nation. She told the People, she told them all, that the dead will arise from their graves. Bringing joy and bringing wealth. But she was telling a lie.” I'm planning to use the quote as an allusion in my major work and need it for referencing. You help is much appreciated. Nice read. I am more interested in Nkonki family who refused to kill their cows. Nkonki family is successful even today. 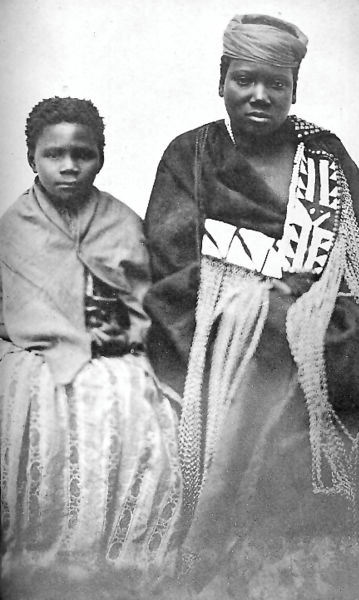 I believe the Nongqawuse story will never be balanced if this family is not mentioned. I am not sure that I can help the person who once hinted me by this event was my late father whose education didn't go that far - We are the Matini's of Mntlane clan from Centane where this tragedy took place .His great grandfather was of Nkonki family ( He said he was Martin Nkonki )who he said they refused to slaughter their cattle - To cut the story short he fled from Qolora village and he established himself about 20-30 kilomters in a village of Amaqaba called Gcina along Mazeppa Bay . People of that village couldn't proniunce Martin properly , we ended up being Matini .Nantso into endayiva ngexhego lam laseMantlaneni ukuba ooNkonki aba , yayingaMantlane. I heard from some of the Nkonki family members. I wanted to verify it as well. Professor Nkonki who was my father's best friend would also tell us about the story. Lwandiso, Morgan, and especially Allan: I think it's vital to explore any family ties' historical information. We're already 4 or more generations away from the truth, and the last generation with any directly attributable hearsay is not here for long. My gut feeling is (and sorry if this is offensive) the influence was not so much from Nongqawuse, but from Mhlakaza. How could a young girl carry so much influence? Especially as, seemingly, nothing is known of her reputation or past doings? An older man, perhaps in the sway of British bribes, however... seems more likely than fooling a young girl with smoke and mirrors. Who really knows? Interesting indeed and greetings to all. I have to agree with Jeff on this one and further assert that it is quite important to study, understand and acknowledge history in order to effectively address the challenges of the present while proactively crafting the future of our nation. May I also add that I am one of those who believe that the origins of Nongqawuse's so called prophecy cannot be divorced from the British's efforts to defeat the resilient Xhosa Kings. In saying the above I am driven by the realisation that while over time we have arrived at a point where we can say we have an agreed collective definition of ourselves as the South African nation, as it was during the historic times of Dr William Dunlop and Sarah Baartman, Mhlakaza, Nongqawuse and Sir George Grey and that of the Great King Hintsa, Sir Benjamin D'Urban and General Harry Smith, the competing interests of the various colours of us who make up our beloved Rainbow Nation are just as much an influence on our daily interaction with each other as they were back then. As a middle-aged black South African, perhaps going through similar motions as Alan, I find myself confronted by this strong need to consider my cumulative experience and the historical accounts preceding my individual existence that identify uMshwai as an African by origin and a South African by birth. I am sad to say that the picture that culminates out of this exercise is not an inspiring one. I certainly do not feel any less subjugated, humiliated and dehumanised living in the so called constitutional democracy than I imagine I would have felt in those historical times. Emotional as I think I am justified to be today, I also have to wonder if things will really be better tomorrow or that I could just be fooling myself. This as the sound of the infamous words of PW Botha justifying the Apartheid policy in the not so distant past start to reluctantly fade in my head, the Nobel Peace Prize winner in the person of FW De Klerk comes out to amplify the same in 2012! I have to wonder if there is realistic hope for the kind of South Africa that the Freedom Charter envisaged or was it all just a pipe dream of the subjugated African majority? A pipe dream, perhaps that being the inferior race that we ought to know we are, we were not even justified to dream in the first place. I hope we can start as South Africans of all races, on genuine course to reconciliation as opposed to the slippery path we are currently on, which unfortunately is once again very much seems to feed on an a dehumanising and delegitimizing South Easterly political strategy emanating from bottom most tip of our continent. How unfortunate! What is worrying about the history of the frontier wars are the numerous gaps in the narratives that attempt to give an account of what transpired between the British and amaXhosa: I will start with the cattle killing then pose a number of questions in relation to other notable historical perspectives. Noqgawuse claimed that she saw a strange man in the corn fields - remember during this era Xhosa mythology and spiritual beliefs would not have dismissed a claim of this nature. One must also note that the account of strange voices conveying a prophecy are mostly connected to Noqgawuse and nothing is said about Nonkosi in most accounts. The reason for this is clear - Nonkosi saw mouths relaying the same prophecy in a dam - one can assume that some people submerged themselves in the water and only their voices could be heard speaking and conveying the cattle killing prophecy. The important question in this narrative is - Who were good swimmers such that they could pull up a stunt like this? It is certainly the British. Remember an order was issued from Graham's Town that amaXhosa must be exterminated after the British were defeated at Fort Amstrong in 1850 by an alliance of Khoi and Xhosa warriors. When the British soldiers were marching to reclaim the fort they marched under a flag that had the following words written on it - " EXTERMINATED" The way the history of the Frontier Wars (100 year war) is written by mostly South Africans leaves one with more questions than answers: 1. The area between the Fish and Kei Rivers is small why did it take 100 years to subjugate amaXhosa if it was that easy to do according to South African historical Society propaganda? 2. Why the British built so many military forts if subjugating amaXhosa was easy? The British built 44 identifiable forts, however, delabidated most of them, and 36 fortified posts and other military posts - when one comes accross facts like these - there are obviously questions that are left not adequately answered. 3. After the eighth Frontier war why did the British decide not to advance beyond Butterworth but to retreat and consolidate the hard won Frontier at the same time negotiating to offer a qualified vote to amaXhosa? (until 1910) Why did they bother to negotiate with broken and defeated Xhosas? A person like me, when reading about the history of how the Great House of Phalo conducted itself against the British, one is left wanting to dig in deeply because the content of most narratives tends to raise more questions than answers. That is the tragedy of how the story of such a protracted military encounter between amaXhosa and the British has been misrepresented. I am not a descendant or subject of the House of Phalo, but I am in awe of how they conducted themselves. They were not keen on fighting and went to war as a last resort that says a lot about the type of people they are. 4. The letters that were written by Sir Harry Smith acknowledge the Brilliance of the Xhosa leadership, intelligence of their subjects and their adherence to democratic practises - one can assume that it is the way Xhosa royalty conducted Imbizos (informal 'parliament'). The title of a book written by Robert Suresh on Thabo Mbeki is borrowed from an archival find of some contents of Sir Harry Smith's letters,titled - "Fit to govern: the native intelligence of Thabo Mbeki"